The DHN series of dip switches from Dailywell are single pole, single throw switches with slide action. Electrically rated to 25mA at 24VDC for switching with a carry of 100mA at 50VDC and a mechanical life of 1,000 make and break cycles for each circuit. The DHN series of dip switches from Dailywell are single pole, single throw switches with slide action. 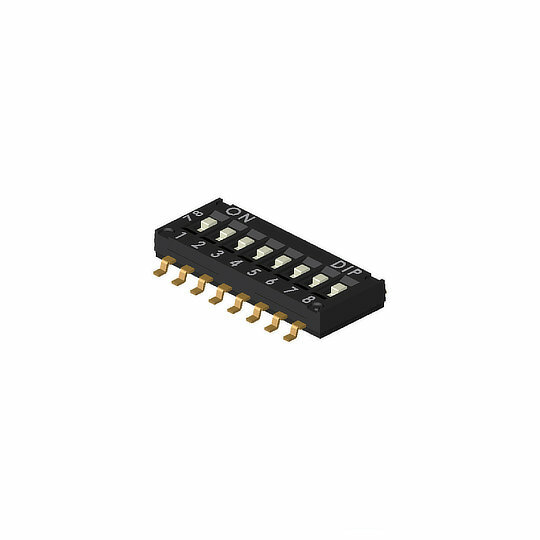 Electrically rated to 25mA at 24VDC for switching with a carry of 100mA at 50VDC and a mechanical life of 1,000 make and break cycles for each circuit. Designed with a choice of 2, 4, 6, 8 or 10 positions available all are designed for PCB mounting and are available in tube or tape and reel options. The DHN series are lead-free solderable, have an operating force of 500gf max making them perfect for applications such as Home Appliances, Computer Peripherals, Industrial Control Systems, Automatic Machine Control and Audio-Video Equipment.